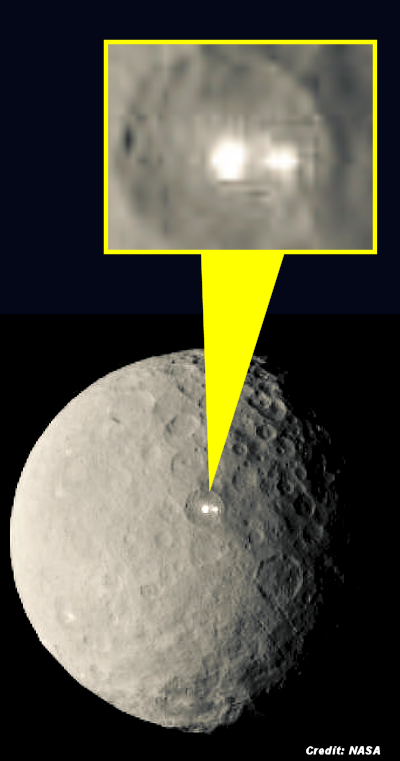 Weird White Spots On Ceres Might Not Be Ice? Pluto may be the star of the dwarf planet scene for the next few days, but let's not forget about Ceres: We've been salivating over the mysterious white spots on its surface since NASA's Dawn orbiter sent its first photos home. But according to the mission's principal investigator, the crowd favorite theory -- that the spots are made of some kind of water or ice -- is probably about to be debunked. According to Christopher Russell of the University of California at Los Angeles, the Dawn mission's principal investigator, the team is "shying away from there being ice on the surface." . . .